"I need money. I need money for Hope." 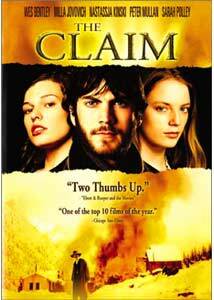 The Claim is one of the most overlooked movies of 2000. In a year filled with a lot of duds, and very few good films, you'd think one like The Claim would rocket to box office success. While it did receive critical accolades, it slipped under the radar of the general public. That's truly a shame, because here we have a highly talented cast, acting out a smart script in the scenic Sierra Nevada Mountains. How can you beat that? Wes Bentley plays Dalglish (pronounced "Dougleash"), head of a survey team for a railroad company in 1896. They arrive in the town of Kingdom Come, owned by Mr. Daniel Dillon (Peter Mullan), who hopes to bring the railroad there. Since having the railroad would mean economic prosperity, Dalglish and his men are wined and dined by Dillon and his woman, Lucia (Milla Jovovich). Dalglish happens to bring two women with him, Elena and Hope Burn (Nastassja Kinski and Sarah Polley, respectively), who have unfinished business with Dillon. While Dalglish determines where to put the railroad, the Burn women's lives become entangled with Dillon's, much to the dismay of Lucia. The whole cast is uniformly strong. Some people had a problem with Wes Bentley as Dalglish, but I think he works well. He's not a hard-edged mountain man, but he does carry a quiet and reserved authority, which I think is the more interesting way to play the character. Also, his role is in no way reminiscent of his part in American Beauty. I actually didn't realize it was the same actor until I had watched for twenty minutes. I knew of Milla Jovovich as a model, and was surprised at her acting ability when I saw Luc Besson's The Fifth Element. By now I know that she is one of the more accomplished actresses (as well as a fine singer and model) working today, and she doesn't disappoint here. In fact, she has the best performance out of anyone. Sarah Polley is competent as Hope, but she lacked energy. Nastassja Kinski, a personal favorite of mine, is in typically fine form as Elena Burn, but her part is too small for my taste. Peter Mullan tops off this fine cast as Daniel Dillon, and his casting was perfect. He is capable of being an evocative, sympathetic man, or an enraged murder and protector of his town. He gives a powerful, expressive performance; it's too bad that the script sabotages him. While the writing is actually more intelligent than most floating around today, the Dillon role is constructed to be entirely unsympathetic. He makes a callous decision early in his life that gains him an empire; but when his past comes back to haunt him, he does his best to make things better, even though doing so hurts the people he loves. Perhaps if he didn't spend time wallowing in self-pity, I would have felt a connection with the character. As it is, he gets everything he deserves, and I had no pity. At this point I want to express my admiration for the cinematographer, Alwin H. Kuchler. This film looks incredible. Of course, when you're filming in the Sierra Nevada in winter, it will look great. But this film uses the environment to its best advantage, and even if the story drags a bit, you can always just look at the color schemes or lighting and appreciate how much care went into the overall image. One scene in particular, in which a band of men and horses are moving a house, is so beautiful and breathtaking that I watched it twice, just to enjoy the intense beauty. The look alone is reason enough to see this film. So often, directors try to be artistic and end up making stylistic choices that distract from the flow of the film. This is one of those cases. For some reason, Michael Winterbottom thought it would be a good idea if, every so often, the camera would go out of focus. Now, some photography can be out of focus, with powerful effect. But in a movie? No. The only time I can think of a good use for this is when a character is regaining consciousness, and the camera starts out of focus and slowly moves into focus. I was intent to watch the characters play out their drama, but suddenly the camera would go out of focus, and I would lose all the connection I had with the story. Or even if I was simply watching the play of a candlelight across a wall, if the camera is out of focus, I end up just waiting for the next shot. Image Transfer Review: This is what a movie from 2000 should look like. A crystal-clear transfer, free from distracting artifacts or dirt. It handles both dark, nighttime scenes and blindingly bright scenes in the snow equally well. Blacks are deep and rich, and fine details are visible. This transfer provides the best way to appreciate the striking look of this film. Audio Transfer Review: This is a pretty good sound mix. All the dialogue and effects are anchored in the front speakers, but the rear speakers still have a noticeable presence. The rears are confined to ambient effects, but since this is the Sierra Nevada Mountains in winter, there are plenty of ambient effects. It's actually rather interesting to listen to the rears; they're used imaginatively. The mix also has a nice low bass end, which I think is essential to a good mix. Extras Review: There is a theatrical trailer, anamorphically enhanced at 2.35:1. Disappointing. The Claim does a good job of transporting you to another time and place. While not as good as critics made it out to be, it is still a highly enjoyable film with only a few flaws. Worth a rental, at the very least.